Day Care for Your Dog! 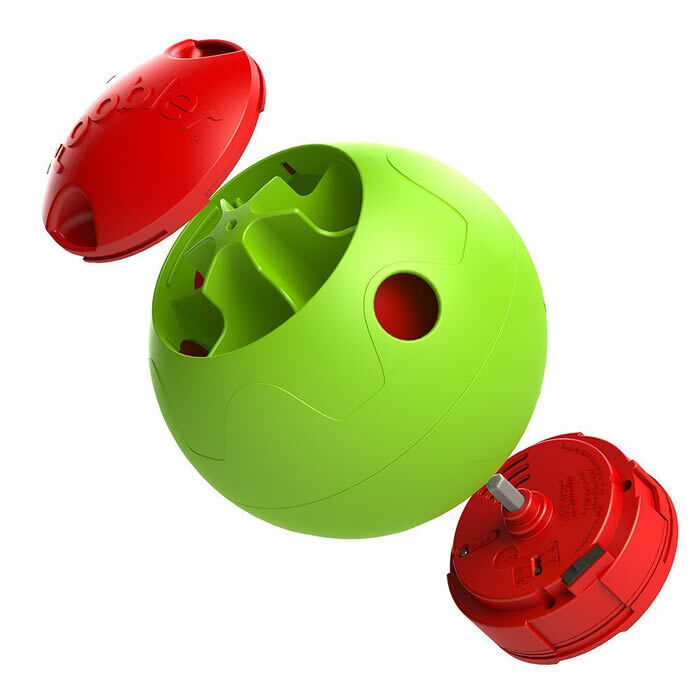 Featured on Dr Harry's High-Tech Boredom Busters episode, the Foobler is an interactive puzzle feeder for your furry mates that can be programmed to release treats over a period of 9 hours. 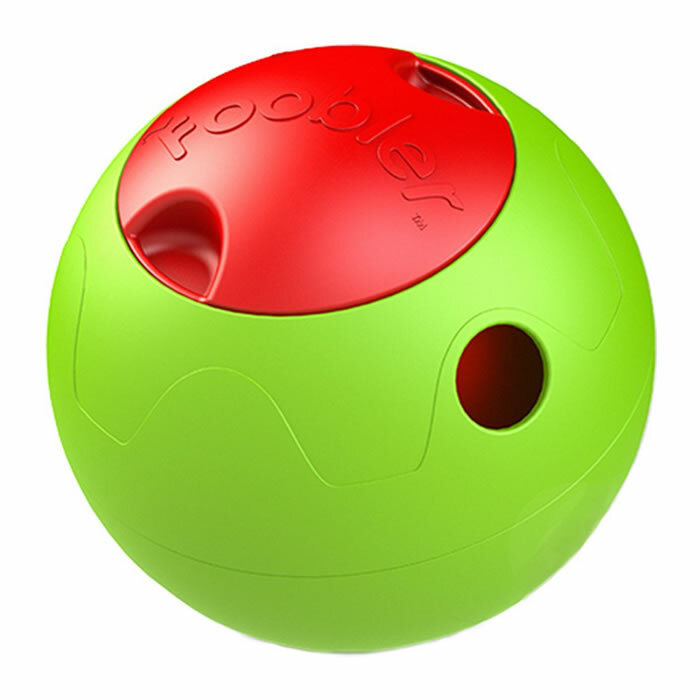 The Foobler holds its own against most dogs without any problem. But, if you have a really tough chewer it may not be the best option for your toothy mate. 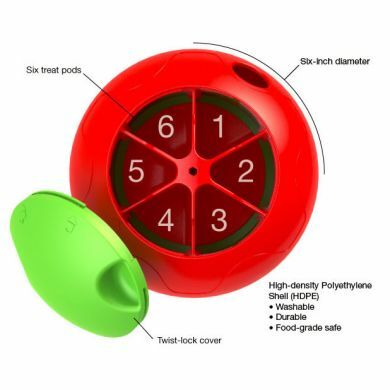 Check out our tough chewers range. The Foobler is an ingenious new dog toy that combines a puzzle toy with a timed treat dispenser, that can be set up to 9 hours in advance. 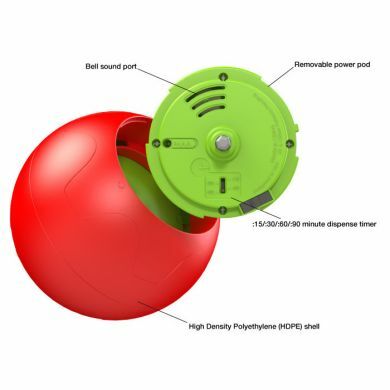 You can set the Foobler's timer in 15/30/60/90 minute time intervals, and when the time is up, a short alarm will sound and it will rotate to the next treating pod, allowing one section of treats to be retrieved by your dog. The Foobler is recommended by many pet behaviourists and dog trainers around the world, including the renowned Dr Sophia Yin. The idea is that since hunting is a dog’s natural instinct, the Foobler trains up the dog in a natural way, by allowing the dog to use its paws and nose to find the treats. Twist off the feeding lid, and pour in your dog’s favourite kibble (or treats). It can accept kibbles up to 12mm in diameter, all part of the daily food intake. To set the time intervals, flip it over, remove the power pod, and select from 15, 30, 60 or 90 minutes on the switch. The bell will ring and the Foobler will be ready to go to start dispensing food. 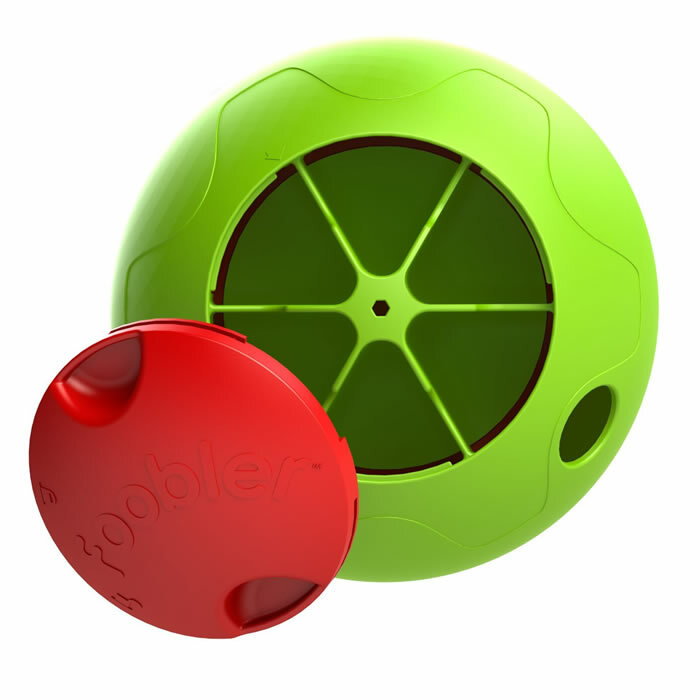 The Foobler holds up to 2 cups of treats or kibble. My dog Jo is fascinated with the Foobler! He is so food oriented that he will push it around for ages. When he realises there is no more food in the compartment, he waits for the bell to ring to try again. The Foobler is so robust that not even Jo has been able to break into it. I had bought another timed food dispenser, but Jo was able to break into it and eat all the food at once! Not the desired effect. Read 7 customer reviews of Foobler Puzzle Treat Toy. The average customer rating is 4.9. Thank you for the swift despatch too. Fantastic toy! 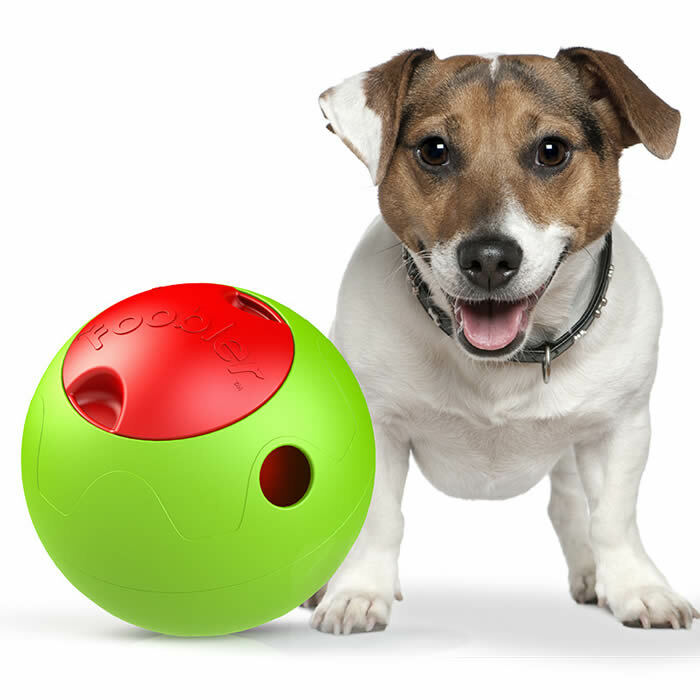 Charlie loves interacting with this, it's great when he's not really into his food, when he hears the bell ring he jumps up with a big smile on hos face and races to play with it. this is a wonderful product. Archie 5 months old labby just went crazy when he played the first time. Pounced on it, barked at it :-) he now has figured out the best way to get the treat out of it is to hit it hard against the wall :-) good one to have when I leave him alone for sometime. I have never loved a ball more in my life! I am a full time student and have a large breed lab x maremma who requires a lot of mental stimulation. In the past I have made contraptions but she generally figures everything out fairly quickly particularly being a food driven breed. This ball had been great, she recognizes that it changes each time it sound and she'll shuffle it around the yard until she's certain nothing else is coming out. It's been a life saver for those days I can't take her for extra long walks. I highly recommend the product for dogs that have a tendency to figure most other toys out. Foobler is really tough. It only took a moment for Yoshi to start pawing at it and pushing with his noes to get the treats to fall out. Great idea to occupy food motivated doggies. Love it. Rusty sits patiently while I start the FOOBLER, after the bell rings he pushes the FOOBLER around to access the treats. I'm sure it's improving paw/eye coordination. It's a wonderful way to occupy his brain and reward him at the same time. It's an excellent investment for my Labradoodle. Postie delivered the fantastic Foobler to our door. Opened it straight away. Was going to save it for her 1st Birthday on the 13th, but I was too excited. She loves it. Even to the point of sitting and waiting for the bell to go off (which I love). Can definitely see this being used daily for when we pop out to the shops. We want to give you a huge thank you for Rhea's new favourite toy.